Trendsetter Home Furnishings has launched Nimbus Emporium, a new premium bedding brand featuring high-end natural fillings. 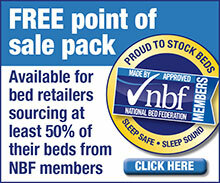 Nimbus brand manager Sara Wadsworth said: “Natural filled products represent more than 30 per cent of overall bedding sales in the UK, seen by many consumers as the ultimate in luxury. Pillows will retail from £60–£200, with duvets expected to sell for £165–£350. Features include Hungarian Goose Down, high thread-count cotton covers and hand-finished piping. The £22.5m Trendsetter company has launched the Nimbus Emporium collection—along with a dedicated website at nimbusbedding.com—with an initial three-tier Gold, Silver and Bronze collection with a 10-year product guarantee.